We had a puzzle with missing pieces and rather than throw it away we decided to put it to good use by making a game to introduce early reading skills to the kids. The best parts were getting the kids involved in making their own game and re-using something that would have been thrown away. We also used the puzzle pins to make puzzle pin jewelry. 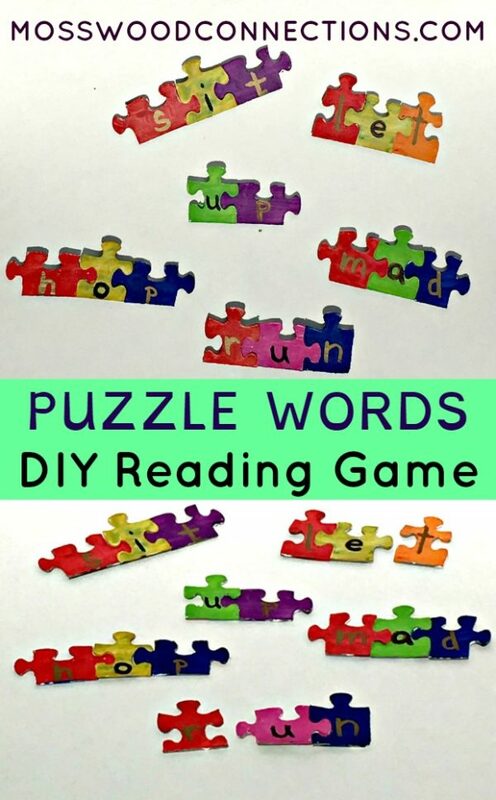 PUZZLE WORDS is an awesome speech and language activity for building early reading skills that will keep the kids engaged as they learn. 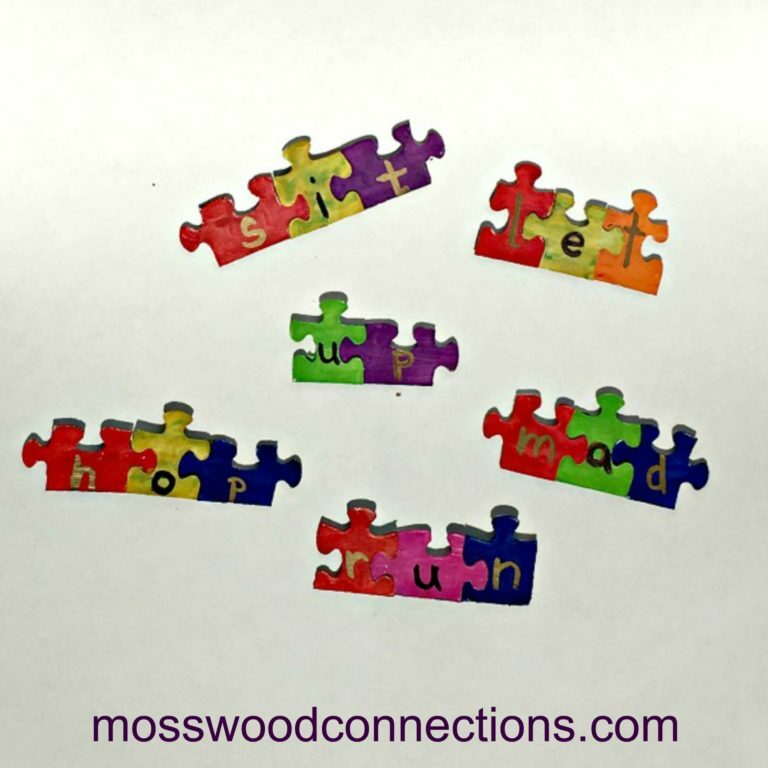 Using the puzzle pieces to make words helps beginning readers to as there will only be one way to fit the pieces together and since most kids like to play with puzzles it makes early reading fun. You can also decide the length of the letters or you could use them to make blending sounds. Foam Paint Brushes work best. Find 3 or more pieces that fit together. Here is a list of CVC words you may want to use on your puzzle pieces. Make groups 2-4 puzzle pieces that link together. Apply an even coat of paint to the backs of the puzzle pieces. Try not to get the paint on the edges as that will make it harder for the pieces to fit together. Allow the pieces to dry. Apply a second coat of paint if needed. Link the pieces together to make sure they fit. Write a simple sight word with one letter on each piece. Voila! You have an early reading skills game made with recycled materials! Apply the chalkboard paint to the back side of the puzzle pieces. Be sure to do this in a well-ventilated area. Allow the pieces to dry. Have the children write the words on the puzzle pieces with their chalk. Once our pieces were made I put them in a pile and the children put them together to make words. Then we had them share their words to make silly sentences. We also made a set of action words like jump, skip, run and had the children do the action the letters spelled. I think that was my favorite part; watching the children laughing and enjoying exploring language. They had a blast playing and reading together!